Just as I expected, Thailand has thrown me into a wonderful and beautiful culture shock that I’m just beginning to fall out of. The beautiful aspect has stayed but my legs are now getting used to sauntering around these streets with ease and comfort. My first introduction to Thailand was Bangkok and it had me walking around those bustling streets with my mouth half open. I had never seen such an expressive and overwhelming atmosphere before that moment. I may have thought I had visited cities before this but Barcelona, Dublin, Athens….they’ve got nothing on Asia. Every single sidewalk acted as one big market. It’s impossible to pass a street corner that isn’t selling fruit, pad thai, hippy pants or jewellery. The list goes on and on. People are constantly asking you where you’re going and how long you’re planning to stay. They scream, sell like their life depends on it and drive like absolute maniacs. The non existent traffic rules took some getting used to but I eventually mastered the art of crossing the street by standing in the middle of the road and holding out my hand with a smile to stop the cars. Yes, you heard me correctly. 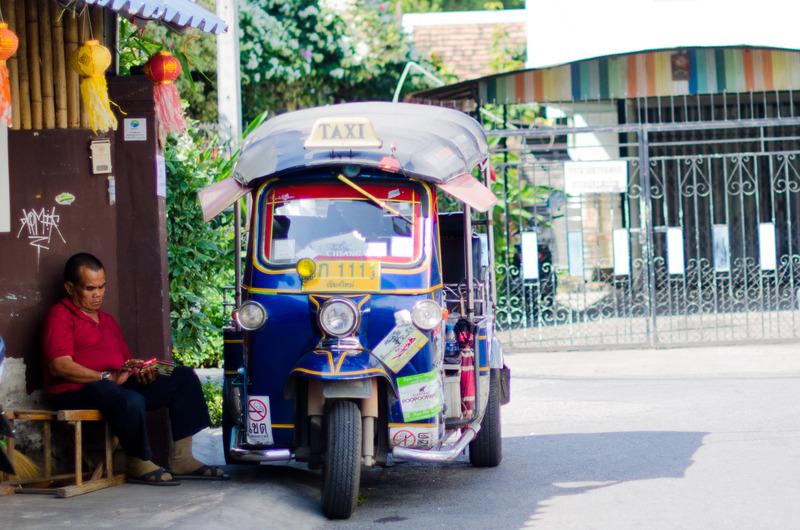 Taking what is called a “tuk-tuk” to manoeuvre around is an experience all on its own. Tuk-tuk (which I heard translates into cheap-cheap. Very accurate) is an open cart driven by a man on a motorized three wheel bike. There are no doors, no seat belts and they don’t slow down for one hot minute. You sit there hanging on for dear life and watch the city zoom by. It’s incredible. This introduction was more than I ever expected and I set the bar pretty high. That being said, I knew Bangkok was a bit of an exception. Many people escape this place as soon as possible. I happened to enjoy it in all its wild wonder but wouldn’t have wanted to stay there for a long period of time. Instead, I was looking forward to spending my days in the cities that brought a little more nature and a lot more originality. After leaving the elephants last Wednesday, Fa drove me all the way to Chiang Mai and as we drove through the vibrant nightlife, I was certain this would be a favourite of them all. 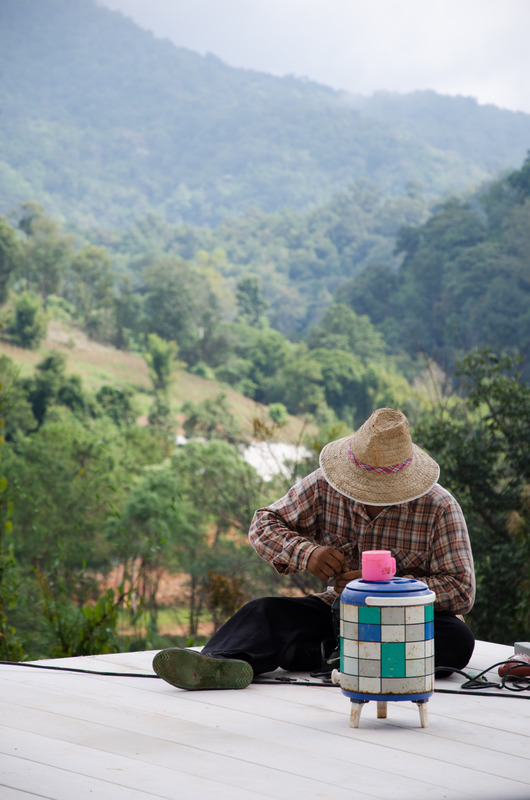 Chiang Mai has such an odd balance of constant live action and complete relaxation. It’s slowly been teaching me that it’s okay if I’m not on my feet and doing something every second of the day. It’s okay for me to calm down for a few hours and walk around with no particular plans or destination in mind. As you’ve probably noticed, I have a lot of trouble excepting that. I have a desperate need to pack in as much as humanly (and maybe inhumanly) possible while in each city. I love it and each minute brings me a new memory and life lesson, but it’s beginning to catch up to me and my poor body. I planned only one big event and the rest came falling into my lap unexpectedly like they always do. Those unplanned moments always end up being the best ones, don’t they? I was blessed to have reached Chiang Mai by car and with company instead of traveling in a cramped and lonely bus. Fa from BLES happened to be heading here for business and said he was happy to have me join the five hour ride. We listened to reggae versions of hot pop songs the entire way and stopped at many unique family run cafes. As soon as our truck made its way into the city, I knew it would be bringing me something special. You could feel the shift in energy here and the night life thrived with culture and community. Community, now that was something I felt was very absent from Bangkok and it’s always a joy to feel. 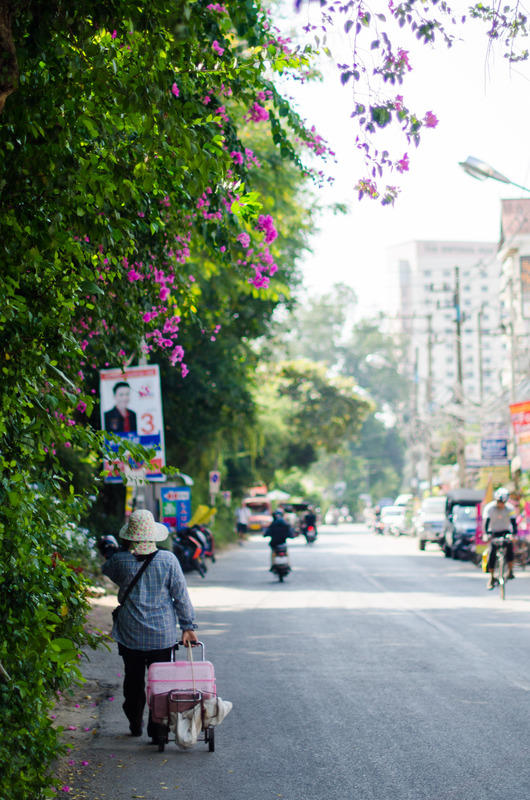 Chiang Mai is a large enough city that you could explore it for days and still have plenty to see but small enough that you could head into a cafe and they would have remembered your name from the last visit. I loved the “don’t worry be happy” feel that each cafe and boutique expressed. Images of Bob Marley could be seen in almost every bar and slapped on sign posts. There was no way to avoid the feeling of peace and harmony. Could there be a better place to rest my head for a few days? I spent my first day there doing whatever my heart desired. I walked out into the sunshine and told myself I would follow impulse and creativity the entire day. Camera in hand, I stayed true to my word. I stopped inside each little shop along the way and admired the colourful, bohemian jewelry and pants hanging on the racks. One thing I’m sure I will miss are the two dollar foot massages I was able to get at the drop of a hat. Every stand selling a fresh fruit shake knew my face by the time I left. It’s worth mentioning that life in Thailand is incredibly inexpensive for a Westerner. Meals cost no more than a dollar and are always made with the freshest ingredients. Street food is a favourite of mine because there’s no hiding how it’s made. 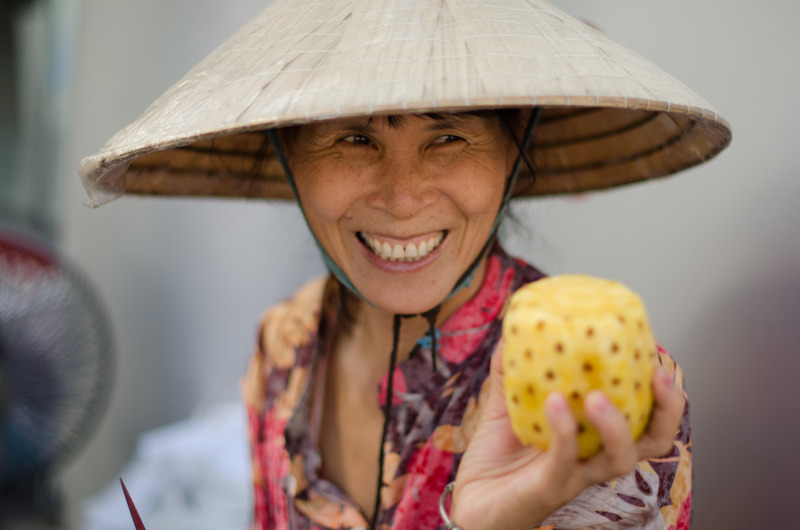 I loved watching them chop the basil and peel the fruit right before my eyes. I was very easily able to live like a Queen. As I walked as slowly and carefully as my legs would take me, I studied the people around me and watched as they lived life in a very different way than the one I’m used to observing. How interesting it was to watch a day in the life of a local. 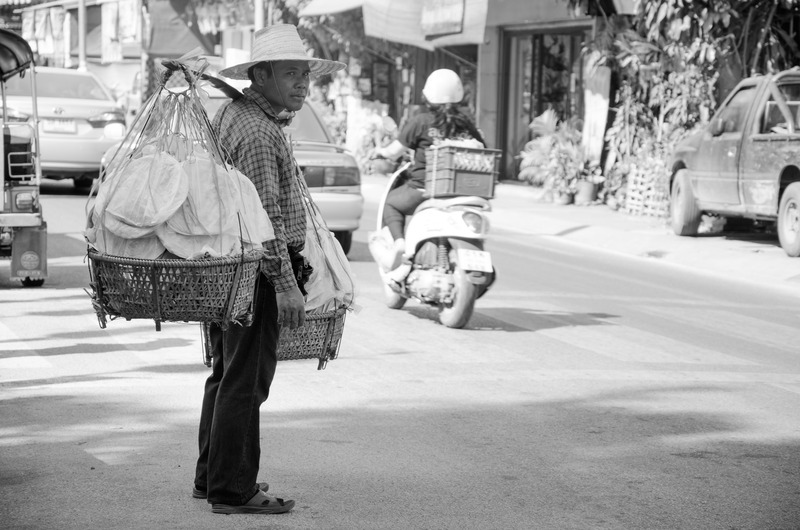 Usually barefoot it seems, Thai’s are often seen working very hard for their money. Many of them spend their days weaving jewellery, selling at a shop or a tent in the market or preparing food. Everything is wholesome and done so naturally, always served with a grateful smile. There was no big machinery or an air conditioned shopping centre around here, only the simplest tools and two bare hands out in the open air or under a wooden veranda. 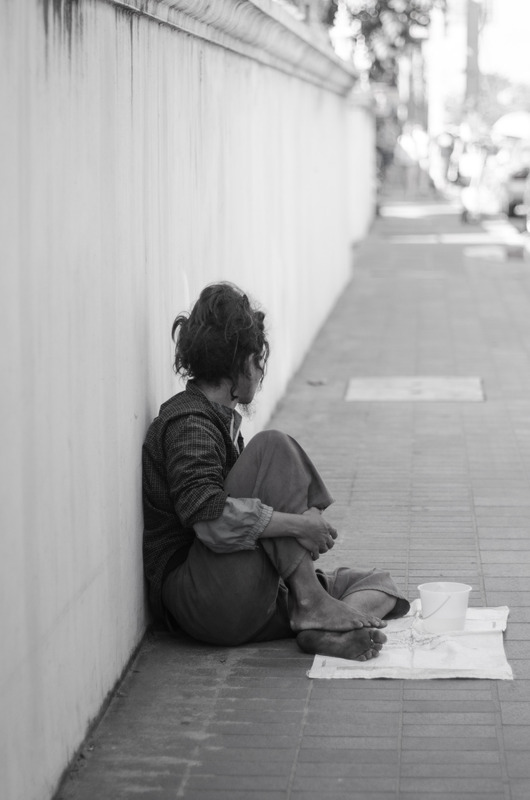 It was rare to see a local doing nothing at all but they performed their daily tasks with as much ease and care as someone who was. Everybody and their mother drives a motor bike (without a helmet or care in the world) and I felt like I was back in Greece again with the amount of wandering stray dogs out and about in the streets. It was wonderful to watch the care they put into everything they did. Preparation was done slowly, surely and resourcefully. They just want to make people happy. 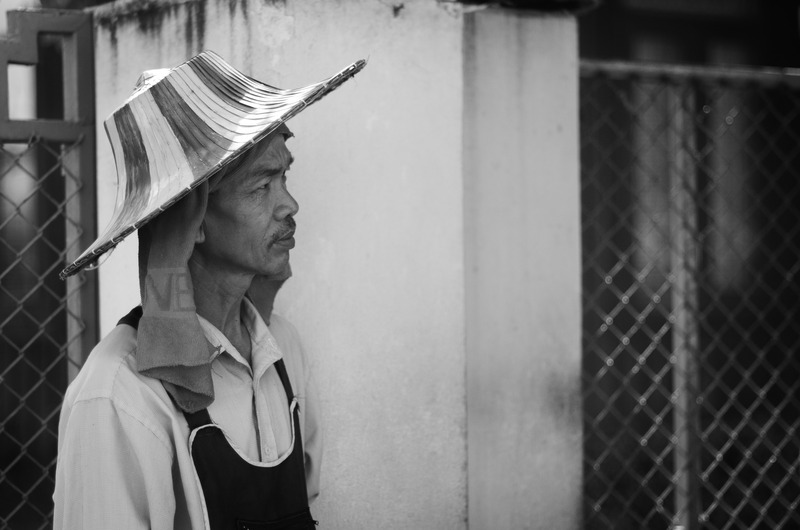 With their unique style and vibrant personality, the people of Asia are so fascinating to capture. I can’t seem to get enough of the temples that bask in their glory around every corner. 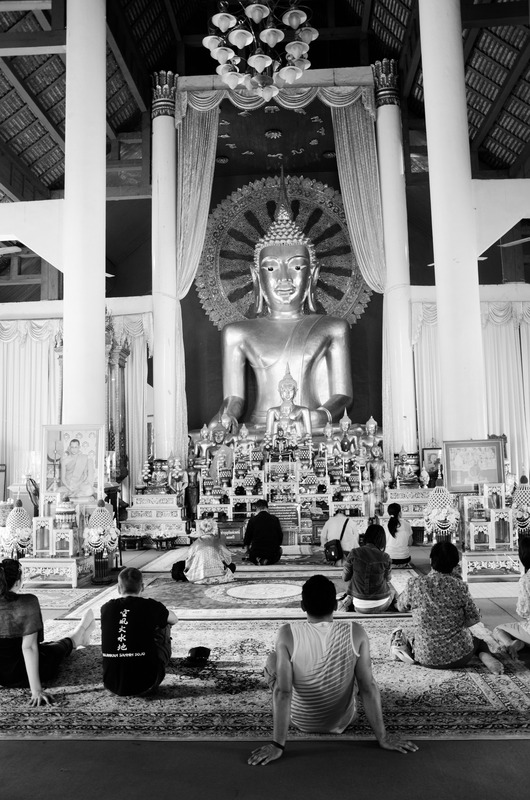 I find Buddhism such a beautiful way of life. It’s a religion that doesn’t brag, boast or throw itself at others. I love that it stands for happiness and inner peace. The statue and image of the Lord Buddha is very sacred and can be found inside every temple as a divine and ruling presence. It’s incredible how much access they have to praise and worship in this country. How beautiful it is that they open their doors for anyone with a sense of curiosity or need to pay respect. The energy inside these vibrant gold tipped buildings will not be forgotten and I liked to visit them from time to time just to feel it all swell within me. I always find myself sitting on the carpet in front of the golden image a little longer than everyone else. It takes me away for a little while and you can’t help but feel affected by the silence and bowing surrounding you. On that note, I took a yoga class that evening to end the day off with the zen that had followed me around since morning. It was easy enough that with my little experience I was able to keep up and follow along for the entire hour. This studio is situated amongst a beautiful outdoor garden with no ceiling and bamboo walls. The man who lead the class had the most relaxed voice I had ever heard and a slight German accent which almost put me to sleep when combined with his reciting of instructions. It stretched my body in every way possible and released anything my muscles may have had pent up. As the evening died down, I wandered further up the main road towards an event called The Night Bazaar. I didn’t know what to expect at first and what I saw completely blew my mind. This market begins at 6pm every single night and sells everything from clothes to food to knock offs of every kind. It stretches for miles and when the entire town is silent, you know where to find the action. The flashing lights and sound of enjoyment echoing through the clanking of pots and pans and music created the perfect night time atmosphere. 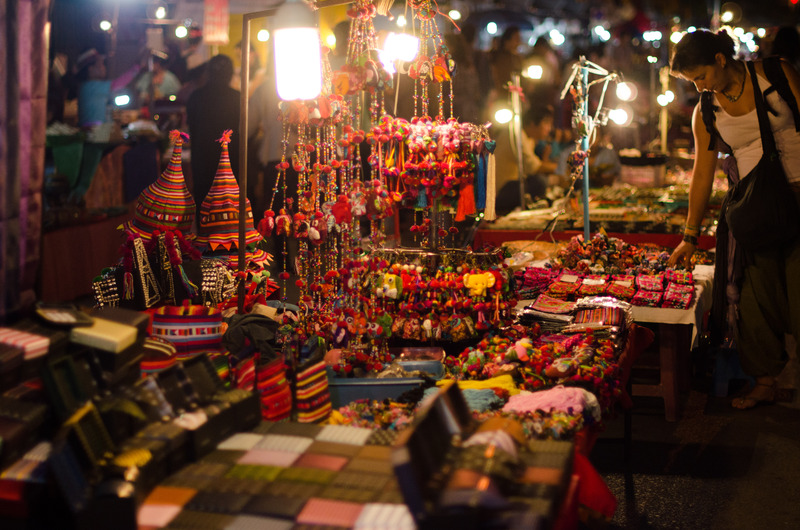 It was very possible to spend your entire evening just walking up and down the rows of stands, admiring the colours and patterns on every handmade item. Around every corner, you’re never certain what to expect and that’s what made it such an interesting place to explore. I didn’t feel lonely in this sea of people, only guided and comforted by their nature of celebration and life. 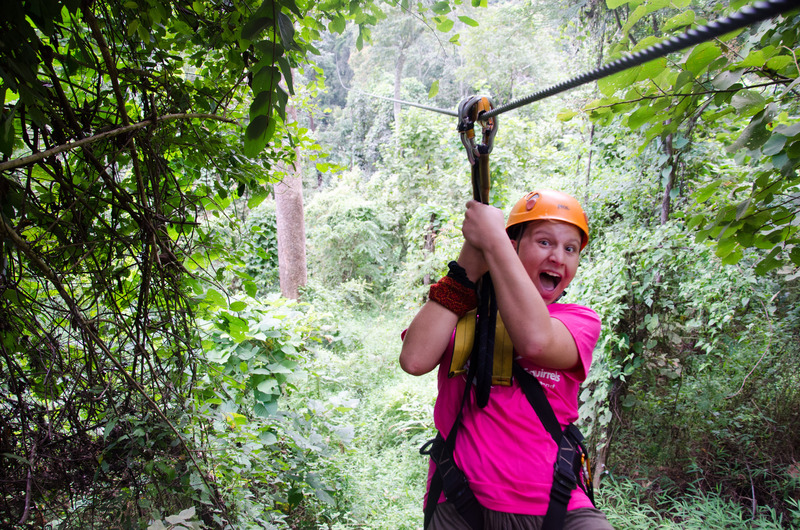 I had thought about going zip lining at some point over my time here and decided to make it happen in Chiang Mai. It’s considered a very popular tourist activity due to the beautiful jungle just about an hour and a half away from the centre. The owner of my hostel named Wee (who I later discovered was an angel in disguise) recommended a company that he has zip lined with and showed me several photos of the amazing and thrilling time he had. I arranged all the details and before I knew it, I was on my way to the site in a van with six others. The view I saw as we rolled up to the bamboo building was breathtaking and the guides were friendly and officiant getting us all geared up. We rode in the back of a truck all the way to the greenery and then up a steep hill to the very first take off point. What I didn’t realize was that there was an entire course here made up of 26 stations. Some of the lines were longer than others (one stretched a whopping 600 metres) and others had you riding on a bicycle, a skateboard or scaling a rope ladder! It was so diverse and the amazing men who helped connect us to each chord had a hysterical sense of humour. They made all of us feel comfortable through the moments where we battled an unknown fear of heights. The first few lines were absolutely terrifying. I’m not going to lie, I do have a slight height fear myself but none of that was going to stop me from mastering each and every section of this wild ride. I slowly began to get more comfortable taking off from each platform. It may have been due to the pushes from Danny and Boom (our leaders) or their reassuring jokes as they threw up their legs and bounced up and down while riding on the lines themselves. This had to be safe if it was holding their monkey shenanigans. 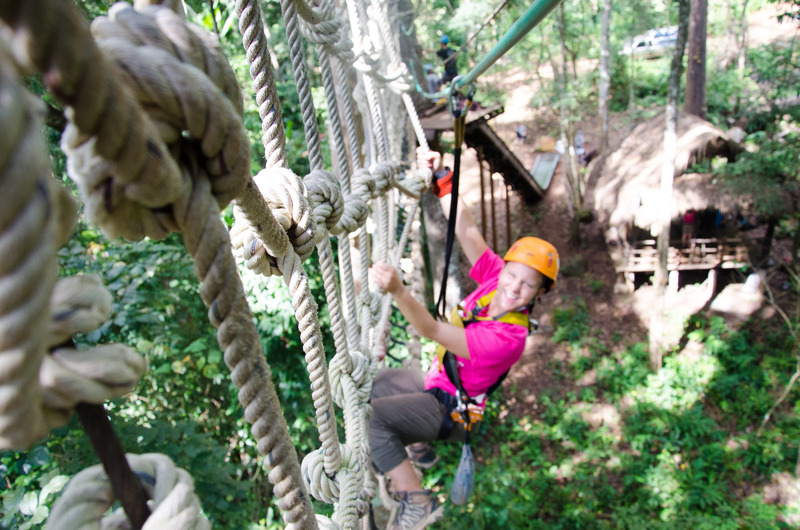 When I was finally sure of my bravery, I took a look below me while flying through the banana trees. Waterfalls flowed beautifully and I could hear animals squawking their calls. It added an extra something to the experience. It reminded me once again where I was. I was in Thailand… and it was beautiful. My adrenalin pumped faster than it ever had before but the 26 stations zoomed by a lot quicker than I imagined they would. I was disappointed too since I was beginning to love that exciting feeling of fear rushing through my veins with each release. I had formed somewhat of a friendship with our crazy leaders and they would always greet me with my name each time it was their turn to hook up my equipment. I was endeared by it all and impressed at the personal touches they added to a system they have to go through day after day. Another surprise waited for me at the end in the form of food. I wasn’t expecting the price to include a meal but a beautiful Thai buffet lay out for us to enjoy and chat over. I spent the next hour getting to know the people in my group from Australia and we shared our favourite memories of our trip around Thailand so far. It was an incredible experience all around and I take my hat off to the company Flying Squirrel. They really know how to create something memorable. The entire day, although fun, was incredibly exhausting. I practically zombie walked to my bed and fell asleep seconds after I hit the pillow. There was no way I was going to enjoy my night out after being so drained. At this point, I was still a tad apprehensive about how long I would be staying in Chiang Mai. Due to the huge once a year festival called Loi Krathong, every single room in the city was booked solid and I had to move from my original hostel into this current one down the road. I was only able to book one night. I decided not to worry about it and deal with things in the morning. There wasn’t a chance I would be missing these festivities that I just happened to be here for. I woke up from my nap, posted a blog and just as I was about to pack my things and head out to explore, a woman knocked at the front door in an attempt to get in. I ran down to open it for her and as she waited for the owner of the hostel to reappear, we began chatting. Lauren is an English Literature teacher in Bangkok and is originally from Ireland. I recognized her accent right away and gushed about how much I loved spending time there. I’ve met several teachers from Bangkok taking a mini weekend vacation so it wasn’t a surprise to meet yet another. She had plans to meet a few colleagues at a famous bar up the road but since she didn’t have a key, it could be impossible for her to get back in. She then asked if I wanted to join her. Not only because I had a key myself and could let her inside at the end of the night, but because we had bonded over travel and wandering and I had no particular plans that evening. It was a perfect scenario and together we headed to what is widely known as “the reggae bar”. This place was incredible and sat in a square of several other bars packed full of locals and other tourists. Everything held a very open feel and the busier it gets, the more inclined you are to meet a new face. The tables are large enough that strangers are bound to sit next to you once things fill and anyone spending their night there has a very similar attitude to yours. 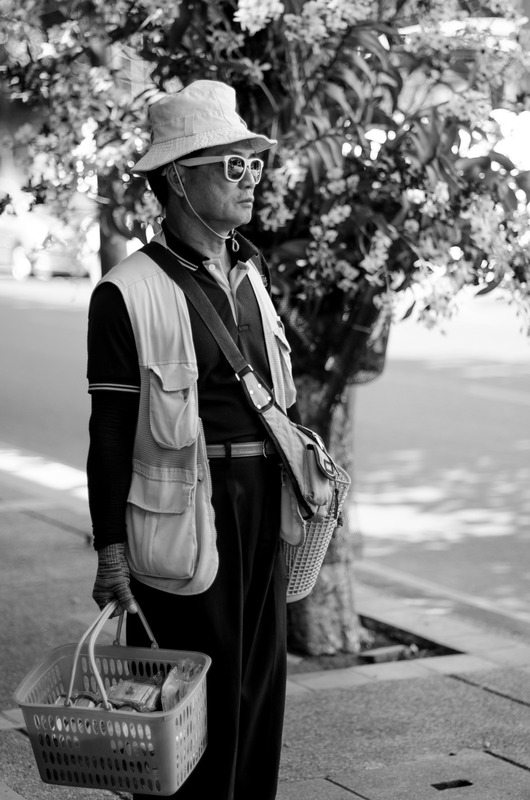 Most travellers in Thailand are cut from the same cloth so whoever you do meet almost always ends in a perfect connection. Lauren’s friends were super down to earth and very welcoming to a youngin’ like me. Have I mentioned how young this journey has made me feel? It’s something I’ve grown to appreciate. Rarely are the people I meet anywhere close to my age and always tell me to bask in the moments of youth. With drink prices being so inexpensive, we ordered several funky cocktails and talked about the bizarreness of Bangkok and wonder of living and working in Southeast Asia. The two men of the group had jokingly given me fake names so I’m still not sure of their real ones but they were quite the funny pair. I absolutely adored the atmosphere of this place and the small Indian cafe in the corner that served delicious food right to your bar table. What a dangerously wonderful combination. 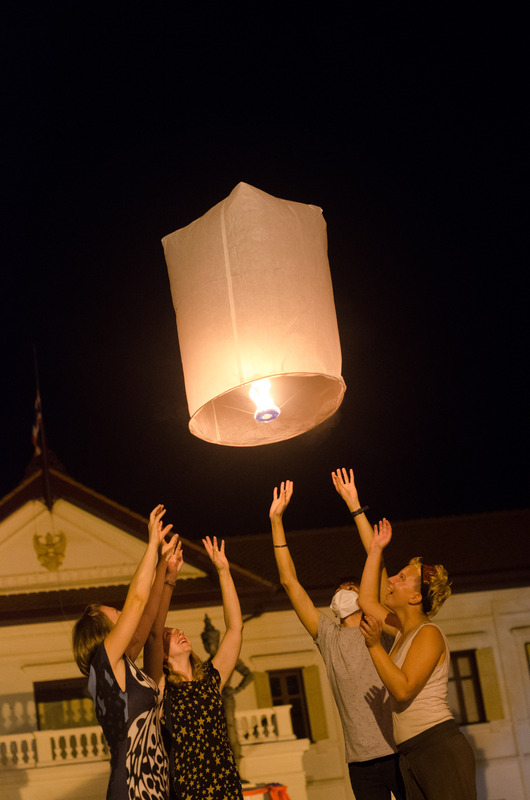 During our chats, we would occasionally look up to see bunches of floating paper lanterns already being lit and released into the air in preparation for the weekend events. Two of the ladies, Pippa and Amy, were dying to run after them and discover their location. After a few more minutes, I agreed to join and the three of us” followed the lanterns”all the way down the road. 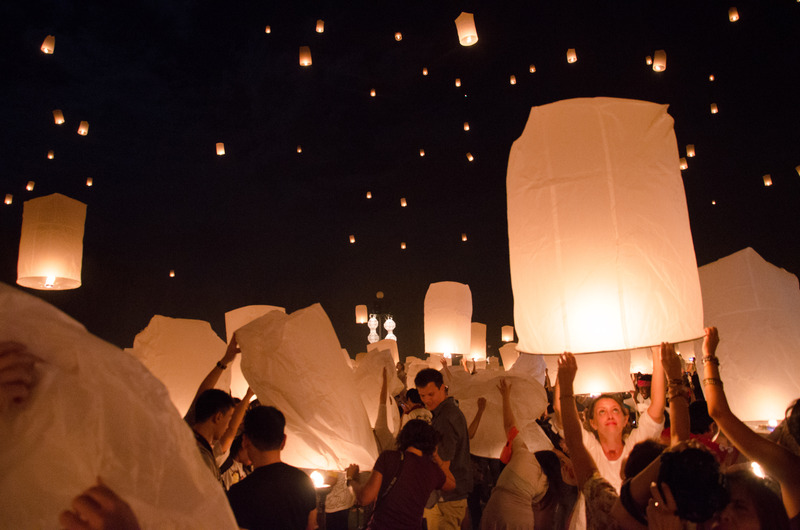 We were lead to a small square filled with people letting go of lanterns and watching them fly. 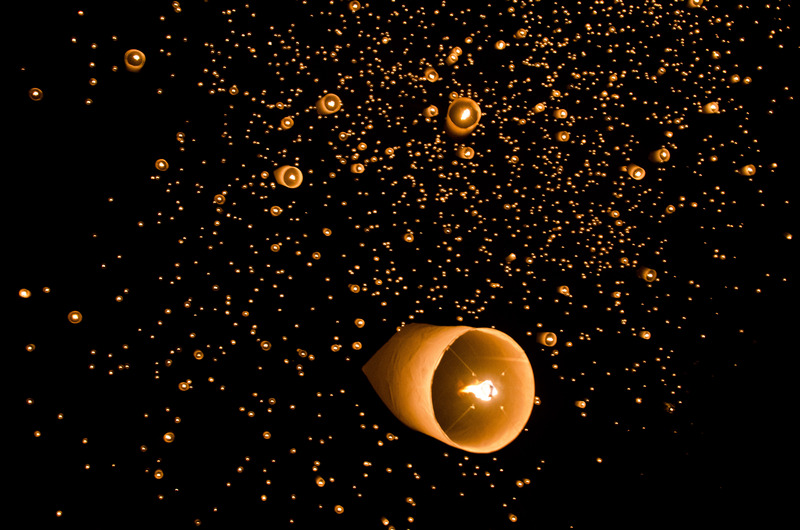 Before watching the big lantern release, it was one of the most beautiful things I had ever seen. We decided to light two of them ourselves and were given instructions by this adorable Thai man who was turning 20 that day. He was very shy but we all sang happy birthday to him anyway as he blushed wildly. He told us about the fortune of good luck it will bring us and how everyone makes a wish before letting go. We were lucky enough to have another man helping us out who is part of a photography team and documented the event perfectly. It was a moment I will never forget and full of pure, undeniable magic. Little did I know, this wasn’t the end of the sparkling celebration. I heard through the grape vine that an even bigger lantern release was being held at the University the next night about forty minutes from the centre of town. I wasn’t sure how I was going to get there and I had no idea where I would be sleeping but I was determined to make it. The next morning I walked back over to my original hostel and spoke to the owner named Wee about my issue and desire to stay over the festival weekend. He was so kind and told me I was able to sleep in the lobby with the three other guests doing the same. He gave me a key to store my valuables in his cupboard and it was all more than I could ever ask for. I briefly mentioned that I was hoping to head to the University that night and he quickly said he would be glad to take me and another boy from the hostel in his car. Not once but twice had he saved me and only minutes had passed. I was given instructions to meet back there at 5pm and spent the whole day anxiously awaiting the nights events. I knew it was going to be something really special. Fireworks had been going off non stop since I arrived and the noises heightened as the big weekend drew closer. People were firing them off from their hands, in the middle of busy crowds and pretty much everywhere somebody shouldn’t be lighting off a fire cracker. At first it was fun and then it just got dangerous. The police presence was strong but nobody seemed to bat an eye. It’s funny how the laws and rules seem to change with each country but the actions that should be stopped never get less scary and life threatening. At least the ones successfully lit coloured the sky in sparkles and had me smiling down every street. I ended up spending most of my day with a lady named Dana, another teacher in Bangkok spending her weekend in Chiang Mai. We met on the street while admiring the same homemade bracelet stand and chatting with the artist who created them. She asked where I was from and said I was more than welcome to walk around with her and the friend she had brought along (I’m so sorry I forgot your name but you were very lovely too). They knew what it was like to travel alone. I was so grateful and took them up on the offer. Dana is someone who I would most definitely be friends with back at home. She carries such a wonderful energy and “go with the flow vibe”. 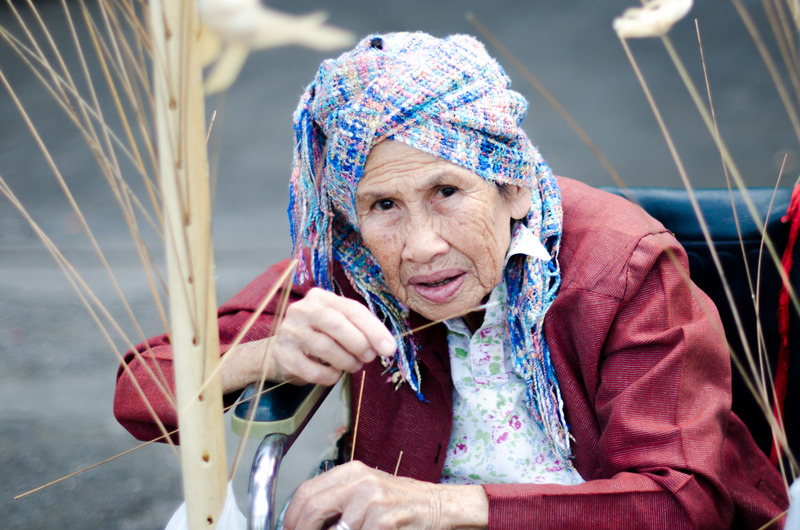 Her personality is one that I could follow along through the streets of Southeast Asia for weeks. Vibrant, fun and willing to go anywhere and do anything. It’s a shame we couldn’t spend more time getting to know each other but the afternoon we did was more than I expected of the day and it felt great to have a full conversation in clear English. I’ve found that meeting people in Thailand hasn’t occurred like it normally does but each one has been an unexpected surprise and joy. When 5pm arrived, I met up with Wee, his girlfriend and another guest at the hostel who would be joining us on the ride to the University. We piled into the car and head off to face the traffic jam that would be invading the roads for the next 48 hours. 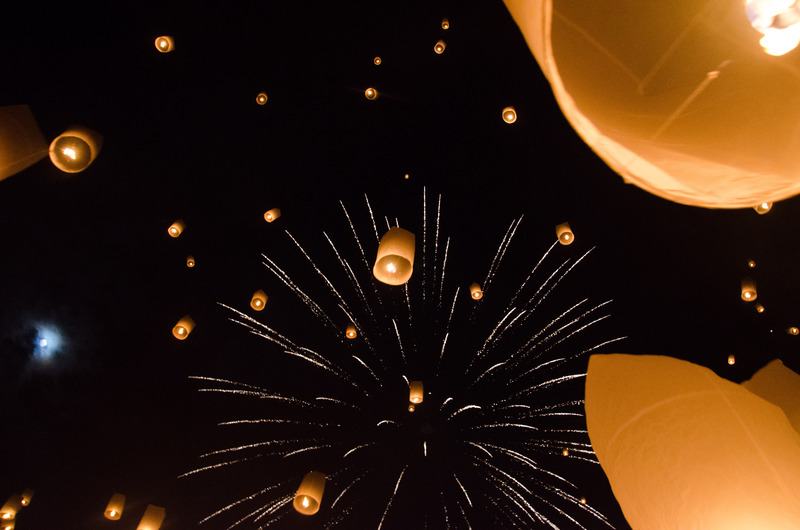 I was thanking my lucky stars that I hadn’t taken the invitation to go with Dana and her friend to the lanterns. I had a feeling in my gut that I should travel there with people who knew the streets. The girls had taken a tuk-tuk and I’m almost positive they didn’t make it in. When we reached our destination, we found that taking a car inside is nearly impossible due to the jam. 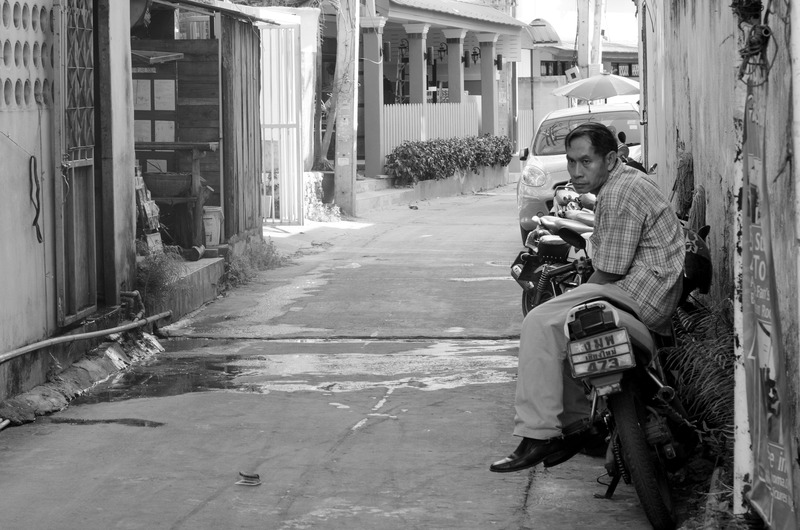 I heard Wee say, “now we switch from car to motorbike” and my stomach lurched a little bit. I had seen how people drove those things. I was beginning to think I wouldn’t make it in alive. We stopped at a house where Wee and his girlfriend picked up two bikes and told us to hop on the back. Normally people don’t hold on to anything while sitting behind the driver but I clutched onto this ladies shoulders for dear life just to be safe. I surprised myself and as soon as we started moving I began to get comfortable and let go. To my amazement, it was quite easy to balance and I felt like a true local as we weaved in and out of traffic. To my family who are cringing at this thought, at least I’m telling you this now that I’m safe! We were dropped off at the entrance in no time and I was shocked at the amount of people who had flocked there. No wonder we needed to bike in. Our two drivers didn’t join us and said they’ve seen the festival many times. I didn’t blame them for not wanting to face the crowds but now that I’ve seen what it stands for, I would be anxious to be a part of it every single year. It was just me and this man from Japan making our way through the sea of people. What a wonderful and sweet guy whose name I also can’t recall because it was so crazy. You think I would be better with names at this point. At first I became a little frustrated with the crowd. It was impossible to move more than two steps forward without a hand on your but or a jab in the ribs. I quickly smartened up and remembered what we were there for. That would make everything worth it. We finally made it to the other side of the crowd and purchased lantern for the big moment. In the centre of the madness was a large opening now full of people sitting on straw mats and holding their lanterns high. 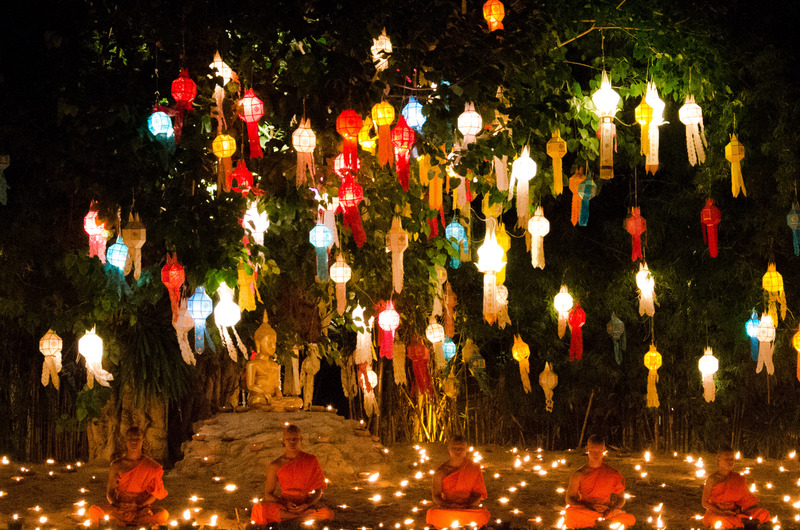 A series of Buddha statues and images sat at the front on a stage, glowing in a beautiful light. Chanting and prayer took place to honour the Lord Buddha and the sight and sound of everyone’s worship sent shivers down my spine. It was incredible to be a part of and watch as they all bowed in unison. At 8pm, everyone scampered to find a seat on the grass and waited for the voice over the speaker to announce the moment we were waiting for. 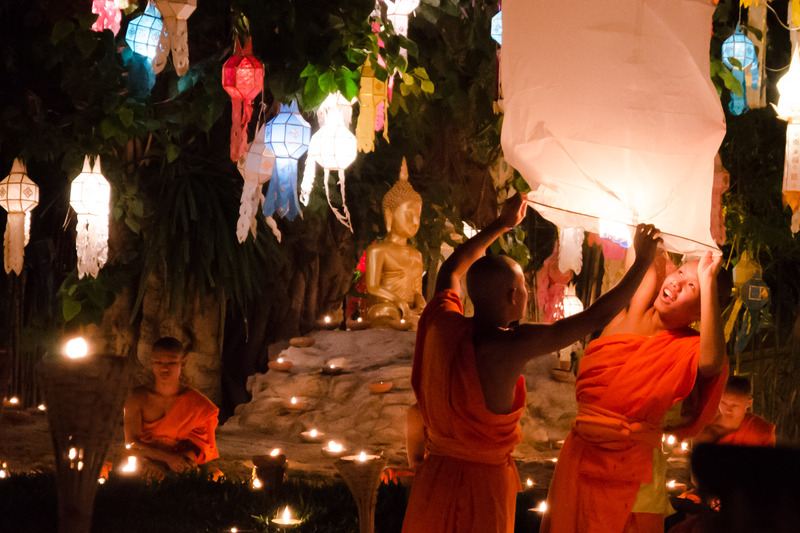 Lanterns had already begun to fly and beautiful music played as several of them trickled up and away. I could hardly imagine the sight that was to follow. A large lantern was lit on the stage in the name of the Lord Buddha and we were told to take a moment of peace to reflect and find our centre. We were reminded to think of those that we loved and send happiness to those we’ve never known. I loved that through all that chaos, this was the ultimate goal. I calmed my mind and focused on every piece of happy I wanted to send out there just moments before the candles in front of us were lit and it was finally time. We made friends with two guys standing beside us and they assisted as we lit our lantern over the flame. It’s a bit of a tricky task. So tricky in fact that ours went up in flames and nearly burned a group of ladies next to us. It was an honest mistake and we tried so hard to be careful but man was it ever scary! I felt pretty let down by that incident. Not only was it shocking but I was now without a lantern to release and I wanted to make a wish more than anything. A very sweet man behind me said I was able to join him and help hold his lantern and his random act of kindness made my heart leap. 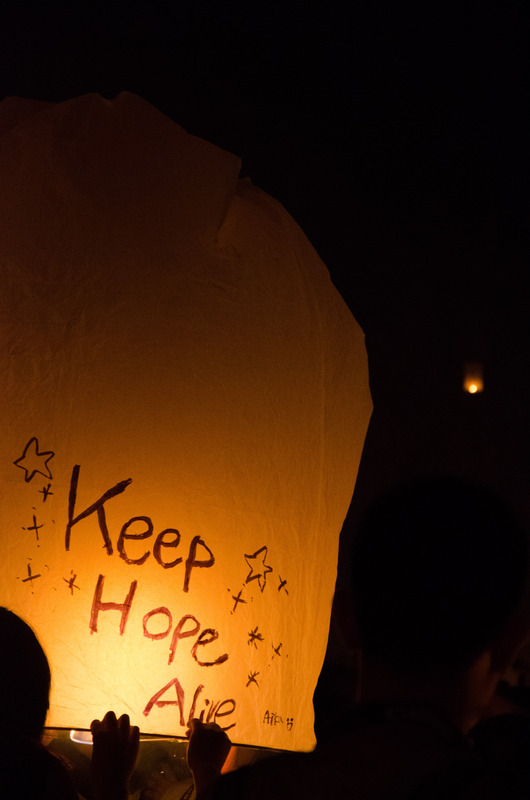 With just seconds to go, I looked around me and watched as these bright paper lanterns lit up the dark night. We were reminded once again to think about our wish and then gracefully, all in unison, we let go. Then I watched them fly. All at once, thousands of dreams, emotions and unspoken words floated high into the air to the sound of gorgeous french music. I was stunned and overwhelmed at the beauty before me. In seconds I was crying full fledged tears and laughing uncontrollably through every shortened breath. They were the happiest tears that have ever fell from my eyes and sparked by one single thought: this moment of unity defied all boundaries. We let go of our differences. Differences in culture, race and religious beliefs. None of that matters in the here and now. Hundreds of us bound together to celebrate and love. It was enough to keep my spirits lifted for a lifetime. I posted this on Facebook just a few hours after returning from this unforgettable evening. There’s no better way to voice what my mind was repeating so I thought I would share it with you all just once more. I walked into the hostel that evening to see a little corner of the back room sectioned off. A neatly made bed sat in the centre filled with pillows and cushions. “This is your homemade bedroom”, Wee told me. He beamed with pride. Well shoot…that had to have been the sweetest thing any stranger has ever done for me. There went the tears again. As if that wasn’t enough excitement already, the following night on the full moon I met a girl named Daniella who took me to a ceremony at a temple in town. There was an area circled off and filled with beautiful candle sticks. The second I walked in I could hear the traditional Asian music softly playing and the voices of anxious visitors awaiting what was to come. We managed to make our way to the front of the crowd and could see a beautiful tree decorated in colourful lanterns as the centre stage. A statue of Buddha sat beneath it and glowed proudly. The entire scene was stunning and once again, truly magical. 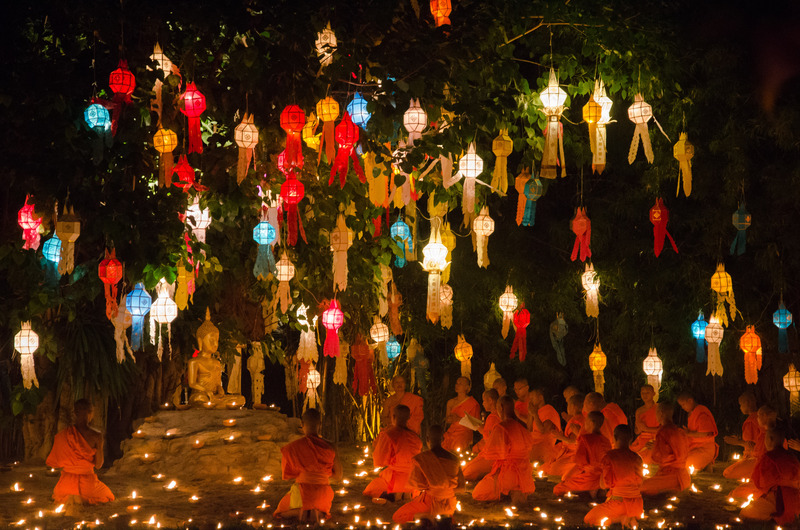 After a few minutes passed, we looked up to see around thirty young Monks dressed in orange robes enter the space. One by one they began lighting the candles as a soft and melodic voice chanted a rhythm of prayer over a speaker above. Each candle was lit with care and precision and I could see the glowing faces of the young Monks smiling in the golden light. They made their way over to the tree and each took a position beneath its beautiful branches facing the Buddha and kneeling slowly. The chanting voice continued and every so often they would bow in unison. Nothing in this world could be more peaceful. I was so grateful to Daniella for taking me here. I never would have known about it otherwise. 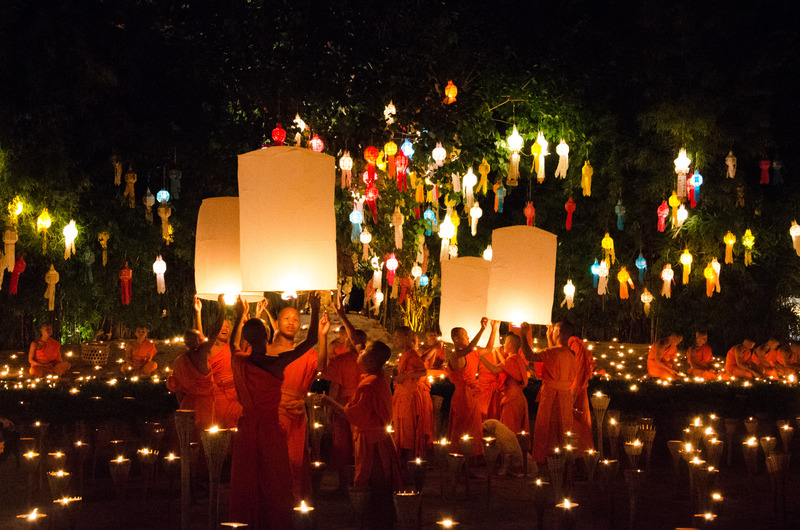 As the Monks rose to their feet, a few of them began lighting lanterns of their own and in no time every one of them was releasing a lantern into the air, laughing and watching in awe much like I had the night before. It sure was an hour to remember and such an unexpected one at that. Didn’t I tell you? Beauty is found in the simplest of forms.